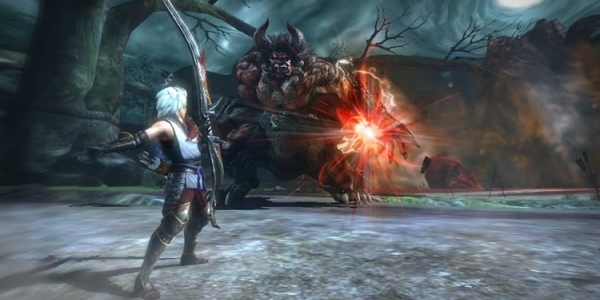 Toukiden: The Age of Demons is set to start slaying Oni on the PlayStation Vita come Feb. 11, meaning that gamers don’t have much longer to wait before they can dive headfirst into Tecmo Koei’s fast-paced take on the hunting genre. It’s a pretty popular category on Sony’s new handheld these days, so the question remains: How does it stack up compared to the competition? According to my recent romp through the demo, the answer appears to be: Quite nicely. Let’s just get this out of the way first: Yes, there are more than a few parallels that can be drawn between Toukiden and the wildly popular Monster Hunter series. But much like the first fighting game or first-person shooter, what started out as a good concept for one game has since evolved into its own genre. And as far as I can tell from my few hours with the Toukiden demo, this latest offering for the PlayStation Vita does the genre justice. The one thing that sets Toukiden apart from the genre’s titular title is an actual story. It’s clear that the world and its characters have been fleshed out nicely in the demo, a chunk of gameplay that actually carries on into the retail version if you decide to make a purchase. Oni (demons) have been running amok for centuries but, quite recently, their numbers have drastically increased. It’s your job as one of the “demons who kill demons” to fight back against the flood, combating your enemies solo, with AI partners or through a separate online campaign that allows you to experience a different tale via ad-hoc, wireless or even solo. Your base of operations is a lovely little town in feudal Japan, where you’ll have access to various shops, crafting, character management, etc. When you’re ready to hit the field of battle, you can take up a new job or retry an old battle to grind materials for upgrading your gear and weapons. Combat is carried out on a large field broken into separate sections. Depending on your goal, you’ll be killing Oni and collecting items along the way, starting with simple monsters that barely pack a punch and working your way up to massive, screen-filling bosses. At your disposal is a wide array of weapons including swords, daggers, bows, spears and the like. Each weapon has its own speed and move set, meaning you’ll be able to fine-tune your character (which is also highly customizable) to become the type of fighter you either prefer to play as or know is best suited to a particular job. You can even register a wide array of loadouts for quick access if you know that a certain weapon set-up will be useful from time to time. In combat, you’ve got a trio of basic attacks at your command, as well as a dodge and a sprint button. Attacking out of a sprint or charging certain attacks might also yield new maneuvers. You can also lock onto an enemy, a god-send in these types of games. Finally, there are the Mitama, the souls of fallen soldiers that, when saved, can be equipped to your various weapons to add stat boosts and whole new move sets and abilities. Combat is fast and fluid, making Toukiden more of a beat-em-up romp than the slow, strategic grind of Monster Hunter. And unlike Soul Sacrifice (Which I happen to love, so no hatemail), there appears to be more options to distract you from combat than just fiddling with your weapon loadout. How deep those waters gets remains to be seen, but it looks like there will be good reason to explore the town and take part in side activities rather than just head into battle after battle. Most importantly, though, Toukiden is fun. I had a blast trying out the various types of weapons and look forward to upgrading them even further once the game proper hits. The Japanese voice cast is also excellent and the story is actually intriguing enough to pull me from mission to mission. So, how will this all pan out once the full game hit the PlayStation Vita? I guess we’ll just have to wait until Feb. 11 to find out. Until then, I’ll be grinding in the online lobbies, happily crushing Oni with my fellow slayers.